~Super Pro - $2500 to win! Guaranteed! ~Sportsman! 1/4 mile for Sportsman! 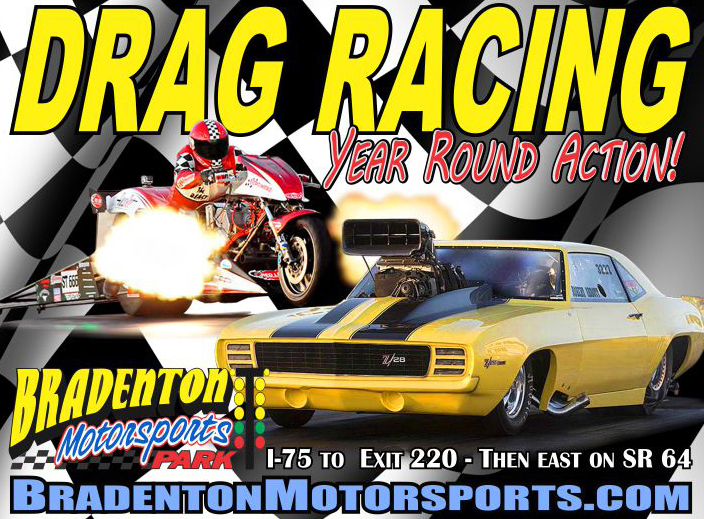 Run order: Jr. Dragster, Super Pro, Street Bike, Super Pro Bike, Pro E.T., Sportsman. 9.10 & under 1/8 mile. No Electronics, footbrake only. 1/4 mile. I-75 to exit 220 in Manatee County. Go 9 mile east on State Road 64 to track entrance on right. I -75 South. Take exit 220 onto SR 64. Go east 9 miles. Track is located on the south side. I-275 South. Go across the Sunshine Skyway Bridge to I-75 South. Take exit 220 onto SR 64. Go east 9 miles. Track is located on South side. I-75 North. Take exit 220 onto SR 64. Go east 9 miles. Track is located on the South side.